A chef is only as good as their cookware… Probably not, but if you plan on continuing to eat for the foreseeable future, a good pan will come in handy. Categories: Kitchen, Le Creuset. Tags: Pan, Stainless Steel. Le Creuset’s tri-ply stainless steel features superior heat conduction, thanks to a full aluminimum core bonded between two layers of professional-grade stainless steel. 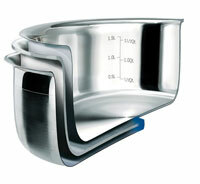 Even heat distribution allows for a variety of cooking techniques like searing, sauteing and pan frying. Le Creuset Tri-Ply Stainless Steel cookware features a commercial grade triple-layer construction — a full aluminum core sandwiched between two layers of premium-quality stainless steel. The heat-responsive aluminum core extends up the sides of the pan to provide even heat distribution and to eliminate scorching and hot spots. 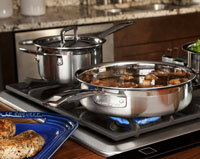 A magnetized stainless steel exterior ensures compatibility with all cooktops, including induction. Please note that the Stainless Steel teakettle is not compatible with induction cooktops. Uncoated cookware is oven-proof to 425 degrees F / 220 degrees C. Every piece of cookware is manually inspected several times during manufacture to ensure the strictest quality standards are maintained. 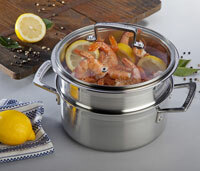 Tri-Ply Stainless Steel cookware is dishwasher safe — including nonstick-coated pieces. Every piece of cookware is manually inspected several times during manufacture to ensure the strictest quality standards are maintained. Le Creuset Tri-Ply Stainless Steel cookware products are covered by a lifetime warranty for uncoated products and a 10-year warranty for products with a nonstick coating. Every piece of cookware is manually inspected several times during manufacture to ensure the strictest quality standards are maintained. Every piece of cookware is manually inspected several times during manufacture to ensure the strictest quality standards are maintained. Every piece of cookware is manually inspected several times during manufacture to ensure the strictest quality standards are maintained. Before first use — Uncoated Remove all packaging and labels. Wash the pan in hot, soapy water, then rinse and dry thoroughly. Your pan is now ready to be used and does not require any further preparation. When frying in an uncoated pan, season the food only after searing on the hot surface. Turn food only when the surface has seared and is easily released. Reduce the temperature after searing. 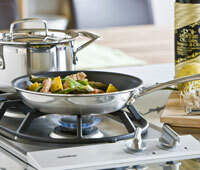 Before first use — Nonstick Before using for the first time it is beneficial to condition the nonstick surface. Rub a film of cooking oil over the surface. Heat the pan for two minutes over a medium setting, then cook and rinse with hot water. Dry thoroughly. When frying in a nonstick-coated pan for the first time, or after the pan has been cleaned in the dishwasher, prepare the pan as follows: 1. Add enough oil to cover the base of the pan. 2. Heat the oil gently and turn the pan to cover the side walls. 3. Remove the pan from the heat, let it cool, and clean it with a paper towel. 4. Add some more oil, fat or butter, and begin cooking as normal. 5. Season the food only after searing on the hot surface. 6. Turn food only when the surface has seared and it easily released. 7. 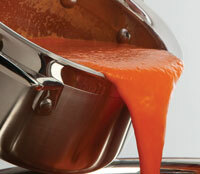 Reduce the temperature after searing. Every piece of cookware is manually inspected several times during manufacture to ensure the strictest quality standards are maintained.